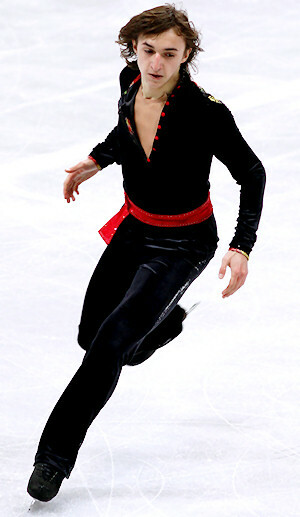 Russia's Artur Dmitriev, 18, performs his long program at the 2011 World Junior Figure Skating Championships. His name turns heads in the figure skating world: Artur Dmitriev. But Dmitriev junior wants to make a name of his own in the sport that made his father one of the most decorated male pair skaters in history. The Russian began competing internationally in the fall of 2009 and was not awarded a Junior Grand Prix assignment at that time. To the surprise of many, however, Dmitriev earned a trip to Junior Worlds in March 2010 after taking the silver medal at the Russian Junior National Figure Skating Championships. In his debut at Junior Worlds, Dmitriev placed 15th in the short program, but catapulted to seventh overall after placing fifth in the long program. He was the only skater who landed a quad toe (in combination with a double toe) in the long program. This past season, Dmitriev debuted on the Junior Grand Prix where he placed second (Ostrava) and fourth (Dresden) and won the Russian National Junior title. At Junior Worlds he placed second in the short program, but finished eighth overall after struggling with the long program. This past season brought many changes for the skater. Right after the Junior Grand Prix, Dmitriev left his hometown of St. Petersburg where he had trained under Alexei Mishin. It’s the same ice rink where his father is coaching pairs and his mother, Tatiana Druchinina, a former World Champion in Rhythmic Gymnastics, is working as a choreographer. He moved to Moscow and is now training in the CSKA Army club under the tutelage of Elena Buianova alongside World Junior Champion Adelina Sotnikova. Dmitriev wasn’t up to discussing the details of his coaching change. Meanwhile, Dmitriev has adapted well to his new training and living conditions. Dmitriev feels welcomed in his practice group at CSKA Moscow. He lives in a private room in an athlete’s hotel on the property of the club. For the first time, he lives alone. He prepares his breakfast and can eat lunch and dinner in the ice rink canteen. “Of course I miss my mom, but basically everything is fine,” the 18-year-old noted. The skater admits readily that he really likes jumps in figure skating. Dmitriev claims he is stronger in jumps, but is working to balance everything out more so that he too can have good choreography and spins. While Dmitriev was reluctant to describe his personality, coach Elena Buianova had to say a lot. Dmitriev revealed that as a child he really didn’t want to skate at first, nor did he ever consider gymnastics, but he always wanted to be a car racer. When the family moved to Hackensack, N.J., he was almost seven years old and started to skate more seriously. Off the ice, Dmitriev is active in his spare time as well. “Sometimes I’m play football and I do other sports. I also want to play paintball, this is a lot of fun. We also want to go karting. I’m interested in a lot of things,” he said. Dmitriev plans to study physical education starting this fall. He is fluent in English as he lived with his parents for seven years in Hackensack before returning to St. Petersburg. “I really like Russia. I want to live here. In America it is also very good, so each place has its positives,” he commented. The quad is a challenge that he loves. However, the quads were gone by the time the season started as he suffered from a back injury. Dmitriev has prepared two new programs for the upcoming season. The short program is set to Beetlejuice, which suits his style very well. The music was suggested to him by Tatiana Tarasova and Buianova. He is very happy with his long program as well, but couldn’t recall the title of the music. His long-term goals obviously include the Olympic Games, but the focus has shifted. Dmitriev denies feeling extra pressure because of his father having won three Olympic medals, including two gold medals, in pair skating. At any rate, it won’t be long before he makes a name for himself.